a hard but proud evening. I did win the “most likely to travel the world” award at a senior year of high school event so please excuse my very idyllic & adventurous thoughts. If you’ve ever had the Whole Foods Seeduction bread, you know what I am talking about…but this bread is truly delicious. 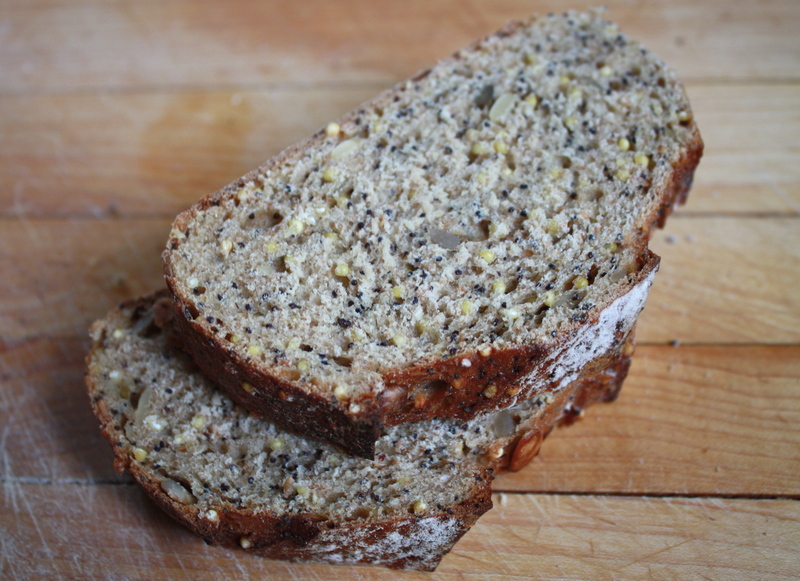 It may even be the perfect bread with the dense seed interior and chewy, yet crunchy crust. Just upon looking at it, you find millet, pepitas, sunflower seeds, and poppy seeds. I probably should have asked about the ingredients within this bread, but my mother had raved about its deliciousness, and I hopped on board. I am unsure if it entirely whole wheat flour or if it is honey free. As someone who tries to eat an entirely plant-based diet, I don’t use honey or eggs, but with something like this bread that may be infused with the slightest amount of honey, I won’t let myself stress. It is how we choose to eat and prepare things for ourselves that is more important. We can’t always have organic ingredients when out to dinner with friends, but sacrificing some things is more important for our happiness than others. 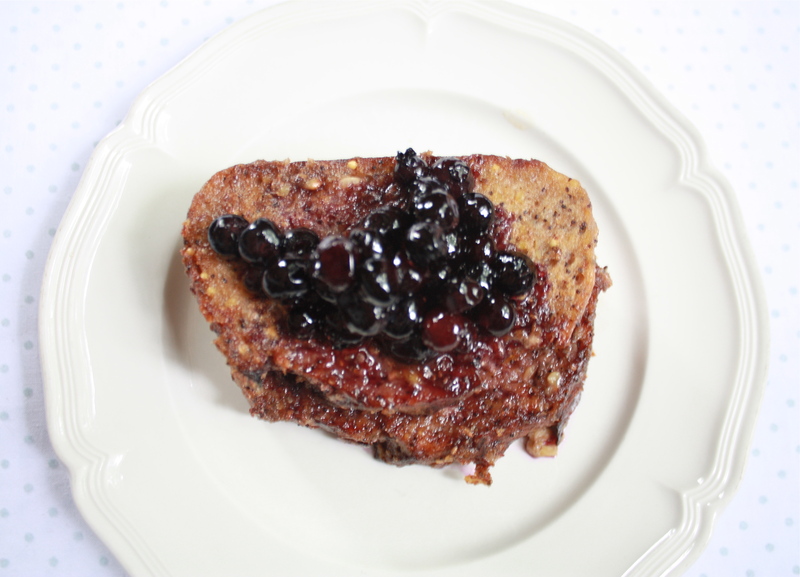 So with this Seeduction bread, a yummy french toast was made with this recipe from (never home) maker I had seen Ashley make and rave about the other day. The french toast did come out more soft than the egg variety, but the banana flavor and texture of the bread made for an amazingly yummy breakfast, one that I will be sure to repeat. Maple syrup, coconut oil, and frozen organic blueberries were poured on top and I ooh-ed and ahh-ed throughout the whole meal. 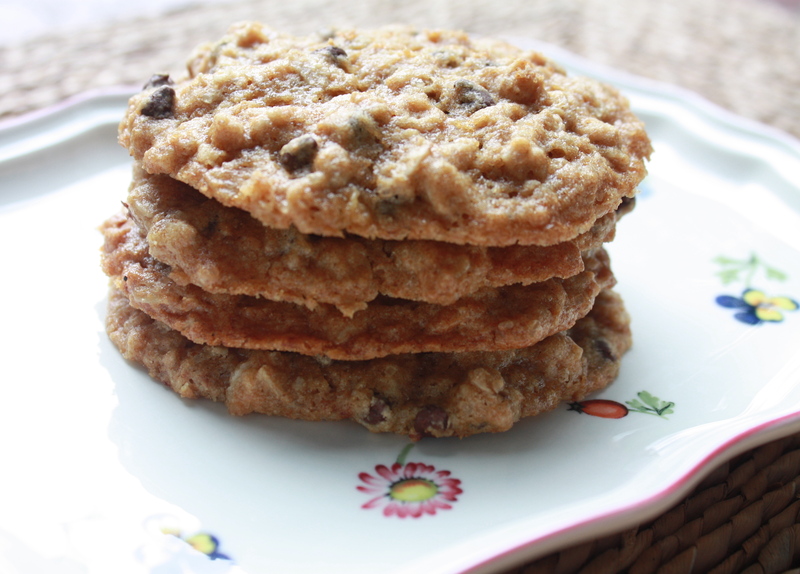 With a craving for some baking, something I adore, even in the warmer months, I made a batch of Dreena’s spelt oatmeal raisin (really used chocolate chips) cookies and added an overly ripe banana. Without any other changes to the recipe, the cookies texture was softer than I had hoped due to the addition of a banana. They were still enjoyed by three of us later in the evening. 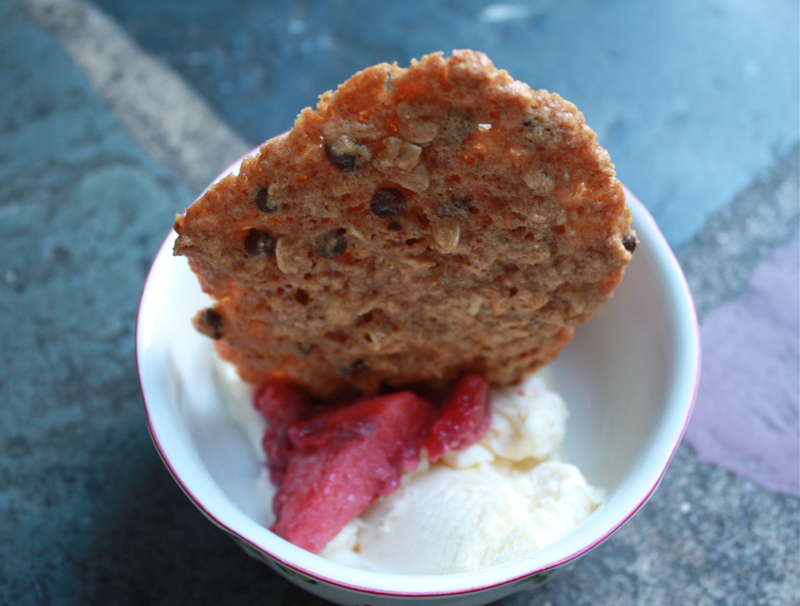 For dessert one night, I had some Coconut milk ice cream, leftover apple berry crisp, and a cookie. It was bliss. I am still eating a lot of the local lettuce we bought at the farmer’s market. It makes me realize why I prefer to buy organic baby spinach most of the winter and save the best romaine and bibb lettuces to the warmer month when I can find it local and better than ever. I dressed it with the better than bottled vinaigrette, and leftover corn salsa. 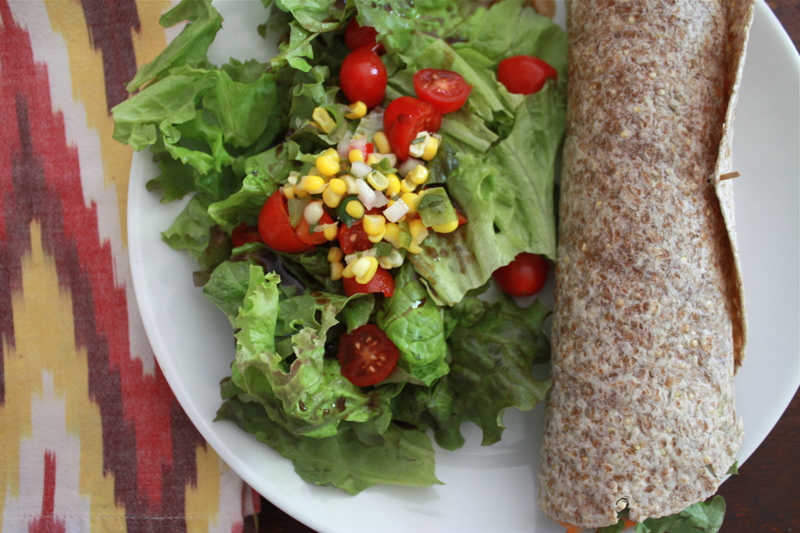 The wrap contained a usual mixture of spinach, hummus, carrots, tomato, and some leftover grilled tempeh. 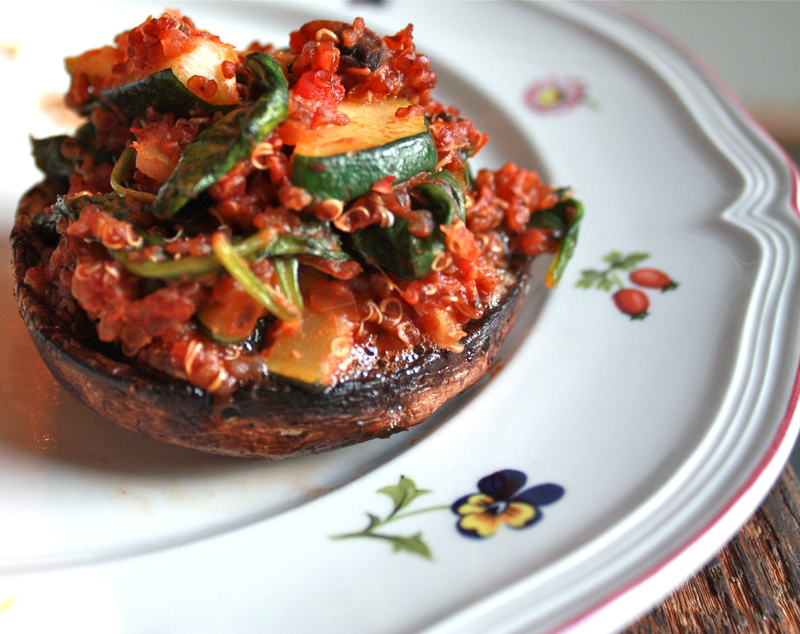 This was a quickly compiled dinner that involved a stuffed portobello with red quinoa, baby spinach, mushrooms, zucchini, V’s basil, and a basic marinara sauce. It was simple, yet tasty. Alongside, we had some more salad. We just can’t seem to get enough of it these days. The warmer days always equals more raw veggies in my day. 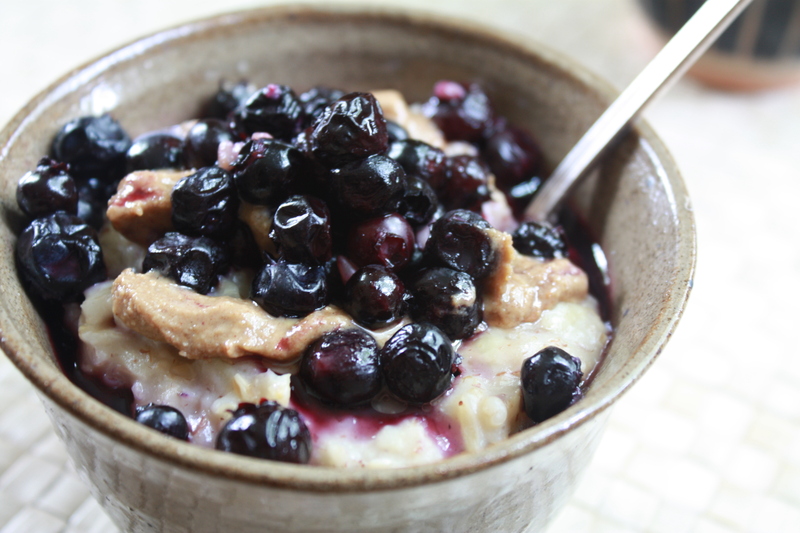 This morning I mixed a steel-cut oats with rolled oats, hoping they would mimic my favorite, Scottish Oats. I used 2 T of Scottish oats, which simmered on the stove top for 10 minutes with unsweetened vanilla almond milk, 1/4 cup of rolled oats, half a banana, and lots of water. 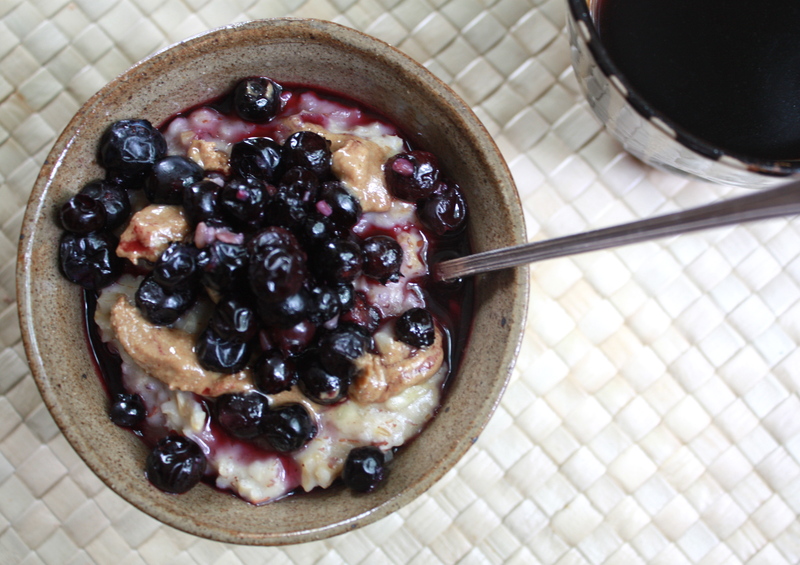 The entire thing took a good 20 minutes, but the results were not as creamy as Scottish Oats. Yes, they were great, but I think I may have to just purchase some more Scottish Oats to satisfy the craving soon. On top of the oats were some more frozen wild blueberries and the cinnamon vanilla sunflower butter I had hidden in the back of my fridge for much too long. Other meals this week have been of similar nature. Fresh berries and juice have been on my mind, so I may be juicing before heading out now. My still current blog obsession just wrote a great post about juicing…read it here. -Do you have a juicer or shell out cash for fresh veggie juice? I got one for Christmas from my parents but must admit it doesn’t get quite as much use as I had planned. Maybe these warmer temperatures are just the push I needed to use it more. -Have you seen this article about the UN urging a meat and dairy free diet? I would love to read your thoughts…I don’t try to make friends or family eat a certain way. Often, I find myself keeping quiet about the matter unless someone else brings it up. These days though, I really feel that some need more urging and things like this may help people realize that just one or two days a week is a great step for our future environment.